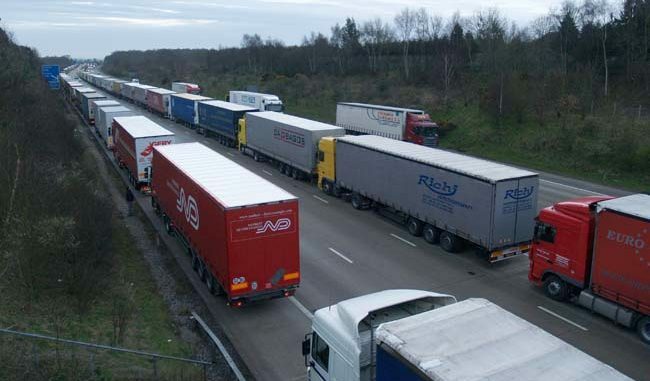 The move is being suggested as a strategy for reducing pressure at Dover if France introduces immediate checks on trucks crossing the Strait of Dover as a result of a no deal Brexit. The confirmation comes following reports that the Government is looking at £200million expansion plans for Ramsgate to combat the Dover ‘bottleneck’ and potentially boost trade with Belgium due to possible routes to Ostend and Rotterdam. The council spokesman said the authority is aware of the Government’s ‘contingency plan’ talks in regards to the port “with other parties,” and said details of the port’s potential had been shared. TDC suggests a Ramsgate ferry route could be particularly beneficial for time sensitive cargo such as chilled foods. A spokesman said: “Thanet District Council has been working on re-establishing ferry services at the Port of Ramsgate and is currently in discussions with a potential operator, Seaborne Freight to establish a freight operation from Ramsgate to Ostend. “The council has been keen to re-establish a ferry service since before the vote to leave the EU. We recognise that Ramsgate could play a role in supporting post-Brexit resilience by offering an alternative route for some cross-Channel traffic, to ensure at least some movement of goods should there be significant delays in Dover. “As part of this the council has reviewed the capability of the Port of Ramsgate to provide capacity to support the Brexit position which, with an investment of £26 million, includes the potential for up to 24 sailings a day which would create capacity to divert 3,360 lorry movements per day from Operation Brock on the M20 and M26, significantly reducing pressure from the Port of Dover during peak traffic flows. Despite negotiations with Seaborne Freight no deal has yet been signed. A service had been mooted to start in March but there has been no update on progress to date. 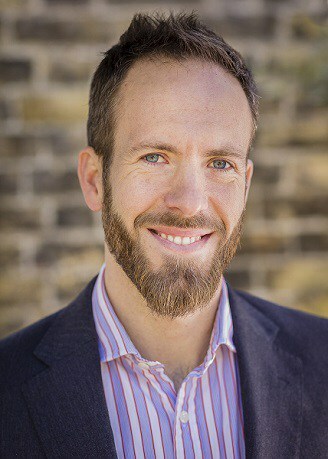 There has not been a cross-Channel operation at Ramsgate since the collapse of TransEuropa in 2013 which left Thanet council owed an unpaid debt of £3.4 million accrued by the ferry firm in port fees..
Former Thanet Green Party Parliamentary candidate Ed Targett has branded the lorry plan as ‘barking mad’ and questioned why the county council is not examining rail freight opportunities. He said: “Dover’s clearly a logistical bottleneck and for the sake of diversifying risk to trade as much as anything else, reviving Ramsgate makes sense on the surface. But the idea of funnelling 3,000 lorries daily through it sounds barking mad; the roads couldn’t take it, air quality would be abysmal and bottlenecks would be horrific. “This whole issue is emblematic of a failure of joined-up thinking. For example KCC committed years ago to delivering a rail freight action plan but has simply never done it. There is capacity on our railways to move more freight but there seems to be neither the will nor the commercial incentives in place to make this happen. 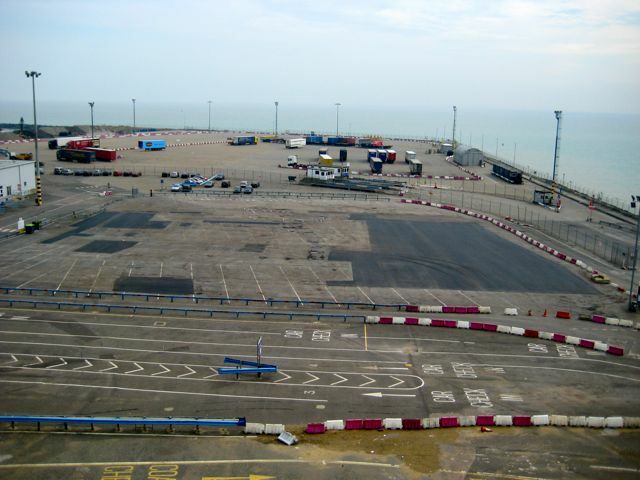 In July Kent County Council said it was urging the Government to invest in the Port of Ramsgate and make more use of current lorry parking facilities at the Manston airport site as part of the Brexit preparations. In January this year The Isle of Thanet News exclusively revealed the emergency lorry park designation had cost the Department for Transport more than £5.7 million since 2015. The majority of the money was for site preparations. It has never been used for emergency lorry parking. This is what we have to expect, the usual yokel great business ideas with no thoughts towards Thanet’s residents or tourists who would be choking to death with the fumes from here and Manston if their dreams came true. Both the sea and air ports closed because they had no business use anymore ! Lorries or planes whichever way some residents of Ramsgate are determined to make Ramsgate a backwater. 3000 plus lorries a day? Great! You can tell the government’s keen on improving air quality,can’t you? Well at least the tunnel would be used for the purpose it was built and not just have fresh air going through it as it has for years. One happy tunnel, 40,000 Ramsgate residents suffering the ill effects of heavily- polluted air. Please explain how 40,000 people in Ramsgate would be adversely affected. The idea of the tunnel is to take the lorry traffic away from the town, thus significantly reducing the pollution and congestion. If the lorries are to be stockpiled at Manston then it makes sense to filter them out through Ramsgate Port rather than sending them to Dover and creating further pollution and congestion there (or are you merely taking a narrow-minded, parochial view ?). The prevailing winds are from the south-west. I am being parochial, clearly, but I don’t think this is always a bad thing. About time, love my day trips. Could is the most important word in Kathy’s headline! TDC could do a lot of things but that doesn’t mean they will ever happen. I think we will see pigs flying over Thanet first. This is a pretty desperate plan.The infrastructure connecting the port to the UK network is woefully inadequate.There is little in the way of port facilities and should they be able to find suitable tonnage to operate a service (with a crew), there are no back systems such as a tug to enable a ferry to get out of difficulties in adverse weather. If they can find a ferry(s), it will not be a UK flag vessel, with UK crew.Simply finding a dredger to clear a channel(s) won’t be easy to find at short notice.Finally if the problem is increased border checks post Brexit, why should Belgium or Holland be any different to France in those circumstances? Can it be that TDC are so set in their ways that they are prepared to inflict major disruption on to one of their own towns, purely to gain a short term benefit in their finances? This casual indifference would be shocking were it not for the fact, that it forms a pattern of indifference towards Ramsgate, held over many years. Belgium and Holland are both part of the UE so whatever border control will have to be put in place in France due to Brexit will also apply to the port of Ostend and Rotterdam, customs checks on all lorries!